From the Kenilworth Eumundi Road turn left into Buckby Road just before Murray’s crossing. Park your car on the gravel at the bottom and walk along the gravel road to the Microwave tower. According to the gps it’s 6kms there and back. Beware this road is used by vehicles. Beautiful scenery. How do you get to the start of the walk? 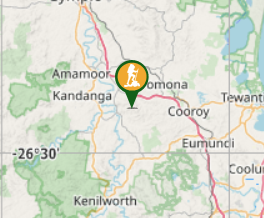 Drive along the Kenilworth Eumundi Road from the Bruce hwy approximately 10km, the turn left into Buckby Road. A detailed description of the walk! Walking up a steep gradient to begin with then it flattens out for awhile, keep walking straight on at the intersection. Don’t turn left, that goes to point Glorious. You should be able to see the Microwave tower from the intersection.